Lavished with awards and critical acclaim, Savannah has been a runaway success for Feadship this year. This can be clearly seen in her circular saloon and the detailed mosaic decoration on the base of the aft deck superyacht swimming pool. Savannah swept the board at the 2016 World Superyacht Awards, winning both Motor Yacht of the Year and the prize for her class (Displacement Motor Yachts 1,300GT to 2,999GT). Gherardi adds that winning these awards was recognition of four years of intense work by everyone at her Paris-based CG Design studio. As newcomers to the superyacht world, CG Design brought a fresh approach to designing a boat, which Gherardi describes as “not classic and not orthodox”. 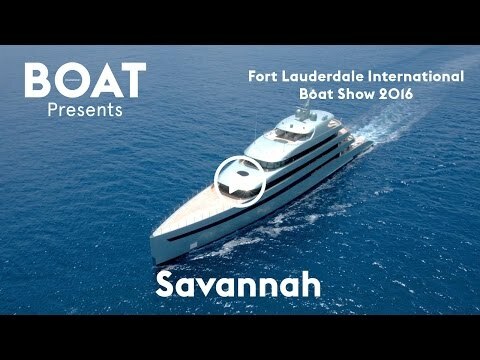 Featuring naval architecture by De Voogt, Savannah boasts accommodation for up to 12 guests split across an owner’s suite, VIP cabin and four further double rooms. Standout interior features include a semi-submerged underwater observation lounge and a spectacular superyacht staircase that unwinds over three decks. Her innovative Wartsila diesel electric propulsion system makes Savannah a highly efficient long-range cruiser, with 14,000 nautical miles clocked up in her first season alone.